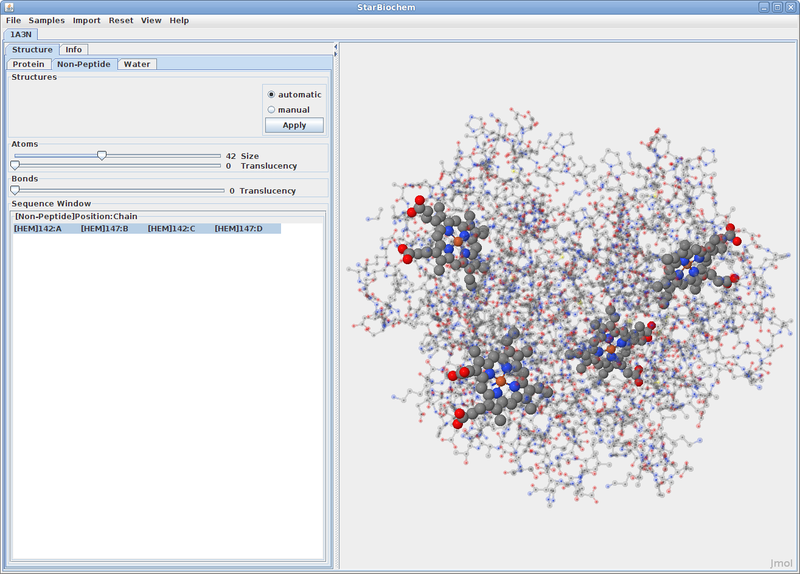 StarBiochem is a 3D protein viewer and runs on standard Linux, Windows and Mac computers. 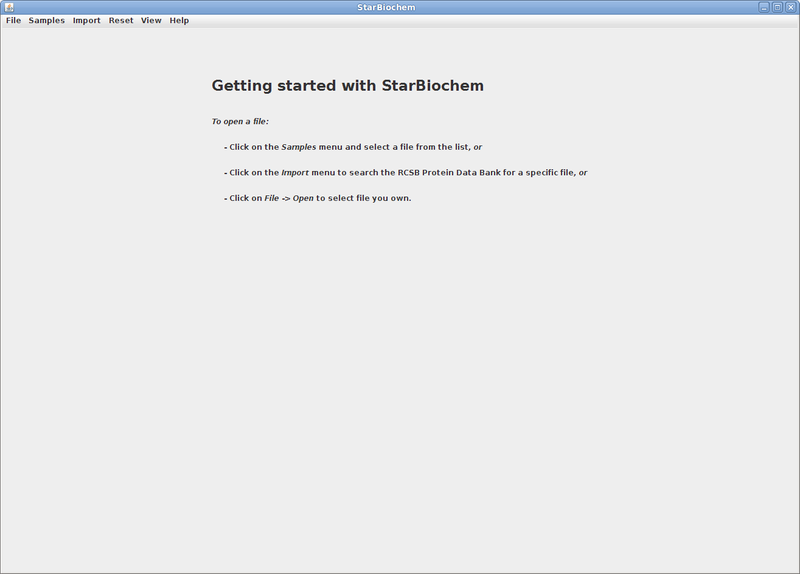 Click on the Start button to launch the StarBiochem application. Click Trust when a prompt appears asking if you trust the certificate. This is the view you will see StarBiochem opens. 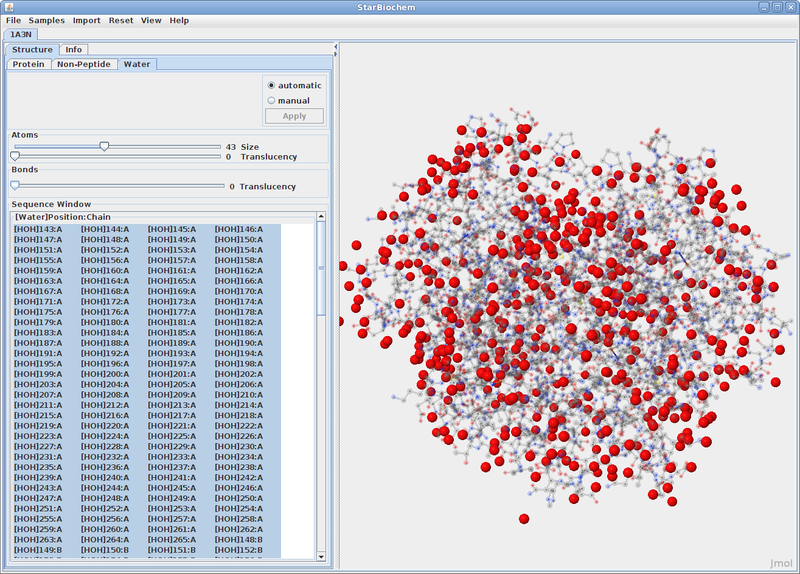 StarBiochem enables the visualization of molecules encoded within the Protein Data Bank (PDB) files. PDB files are named by a four-character ID such as “1GXX”. 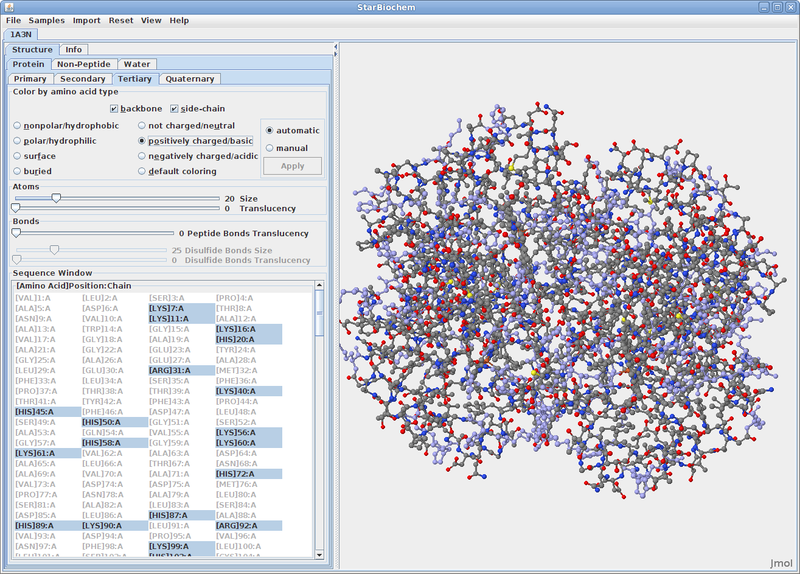 You may load any file found in the PDB, select one from the Samples menu or open files stored locally on your computer. 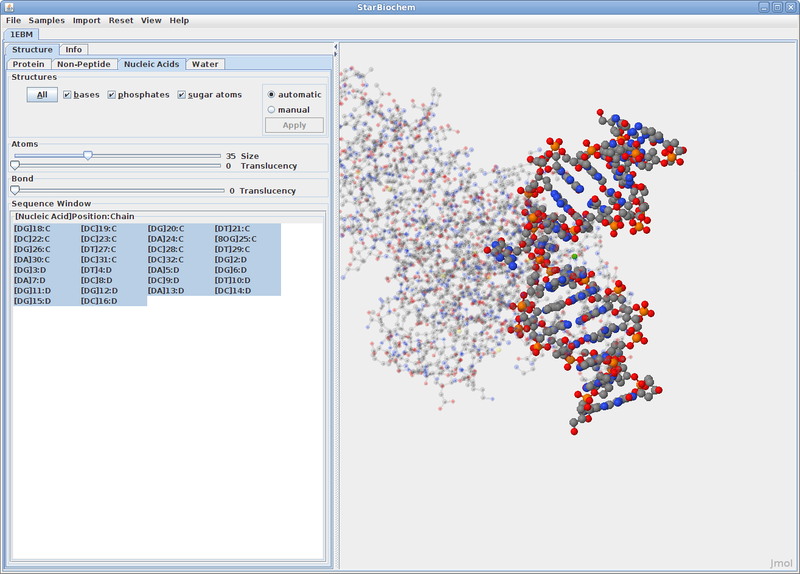 Click on Import -> RCSB (Protein Data Bank). 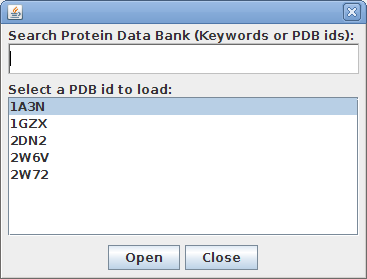 Enter the four-character ID of a PBD file (eg. 3D9S), click Open. When the search results appear, choose the desired PDB file and click Open. 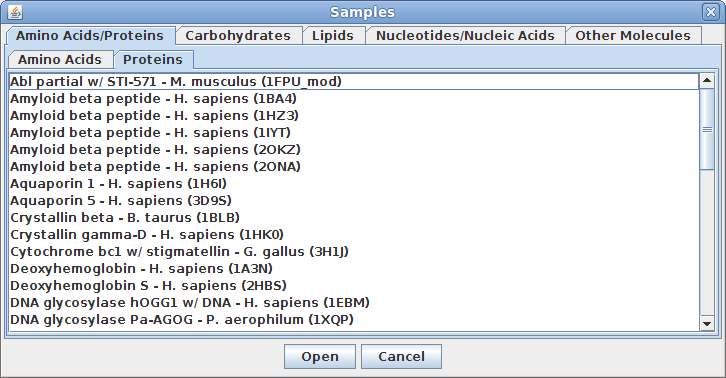 Alternatively, select a PDB file from the Samples menu. To load a PDB file stored locally on your computer, click on File -> Open and select the desired file. 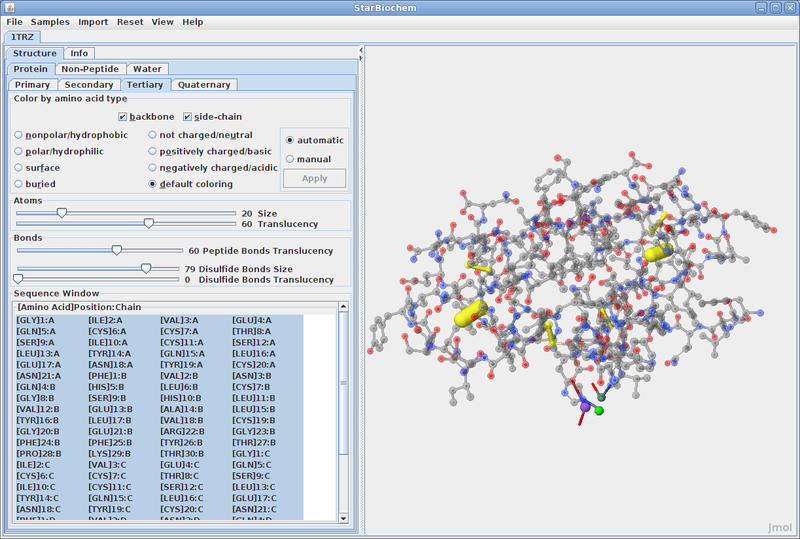 Upon opening a PDB file in StarBiochem, you will see a 3D model of the protein in the viewer. When multiple PBD files are open, they can be closed individually or all at once by clicking on File -> Close, or File -> Close All respectively. Each tab contains Automatic and Manual options which allow you to choose when the changes made are applied to the image. Automatic immediately applies selection, size or translucency changes. Manual allows you to make mutiple changes before clicking the Apply button. This is usually helpful when isolating a specific portion of a structure or making mutiple changes to a large structure which may require more time to render. 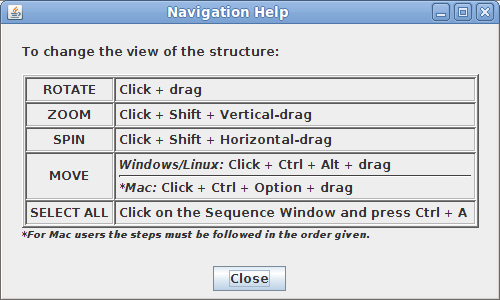 In the top menu selectHelp->Structure viewing instructions. This will open a small window with instructions for manipulating the image of the structure. ball-and-stick model: the atom's nucleus is drawn as a ball and covalent bonds connection atoms are drawn as lines. Advantage: allows a better view of how atoms bond together. space-filled model: atoms are drawn as spheres, whose size represent the physical space an atom occupies (the nucleus plus its surrounding electrons, also called van der Waals radius). Advantage: allows for a more accurat representation of the size of atoms and molecules. 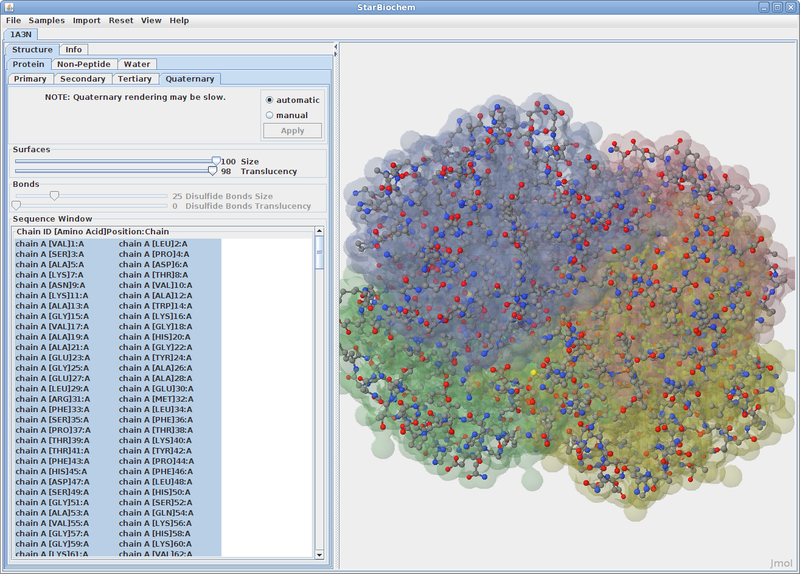 You can switch from the ball-and-stick model to the space-filled model in StarBiochem by increasing the size render of the atoms in the structure. Click on the Primary tab. By default the atom size is 20% which represents the ball-and-stick model. Move the Atoms Size slider completely to the right, 100%, to switch to the space-filled model. The primary structure of a protein lists the amino acids that make up a protein’s sequence, but does not describe their corresponding shape. The secondary structure of a protein refers to how stretches of amino acids within a protein chain are arranged in characteristic patterns such as helices, sheets, and coils. The tertiary structure describes the folded shape of a protein chain and is determined by characteristic properties of the amino acid residues, such as acidic, basic, polar, and non-polar. The quaternary structure indicates the relationship between the chains of a molecule. Click on the Primary tab. 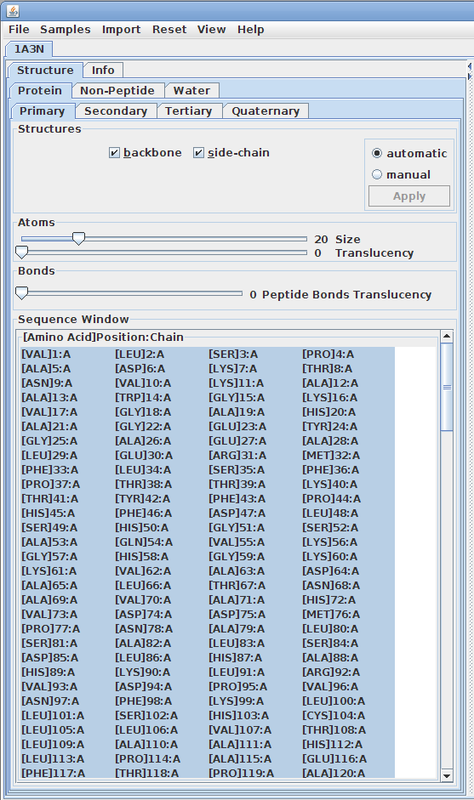 This view shows the amino acid sequence and options for viewing the backbone and sidechain. By default all of the amino acids are selected. Amino acids consist of two parts, backbone and sidechain. Unchecking coloring the box beside backbone or sidechain allows changes to apply only the part that is checked. Click on the Secondary tab. This view shows the sequence of amino acids and the corresponding helices, sheets and/or coils. By default the structures size is set to zero. To display the secondary structures check the box beside the structure(s) needed and move the Size slider to the right to increase the size of the structure(s). Click on the Tertiary tab. This view shows the sequence of amino acids. The default view will mirror the selections and sizes from the Primary tab. To display the residue colors click on the buttons beside the amino types, e.g. polar, nonpolar, etc. Click on the default coloring button to return to the default coloring scheme. Click on the Quaternary tab. This view shows the quarternary chains which are alphabetically and some times numerically identified (e.g. chain A, chain B). By default the surfaces' size are set to zero. To display the quarternary structures (chains) increase the size by moving the Size slider to right. Disulfide bonds may appear in both tertiary and quaternary structures. If the molecule does not contain disulfide bonds the Size and Translucency sliders are disabled. Click on the Nucleic Acids tab. This view will show the sequence of the nucleic acids and options for selecting some or all of the nucliec structures (bases, phosphates, or sugars). Some proteins have the addition of a Non-Peptide tab. 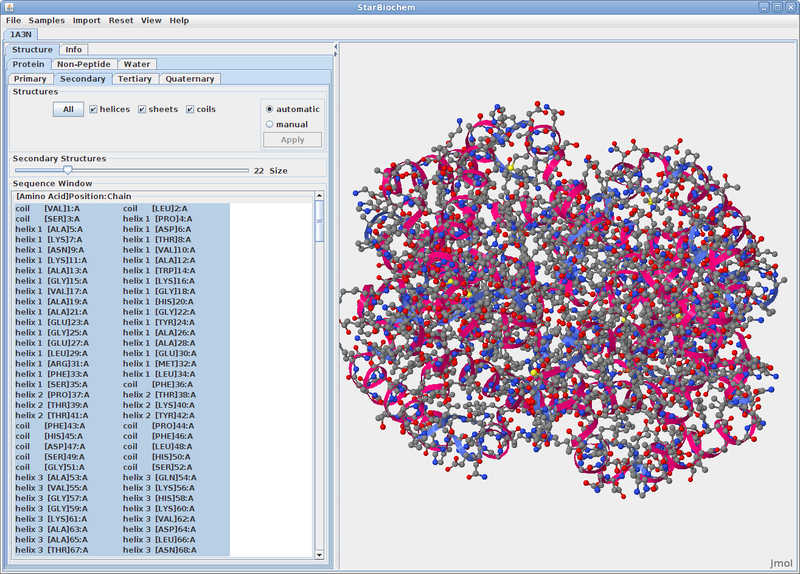 Select this to view any non-peptide atoms within the protein and change their size in the viewer. Many proteins have the addition of a Water tab. 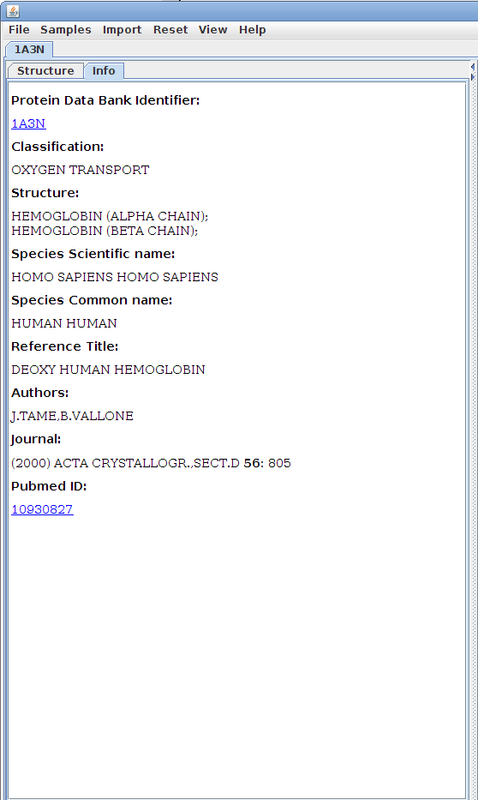 Select this tab to see the oxygens that make up water molecules within the protein (hydrogens rarely defined). By default the size of the water atoms is set to zero. Move the Size slider to the right to make them visible. 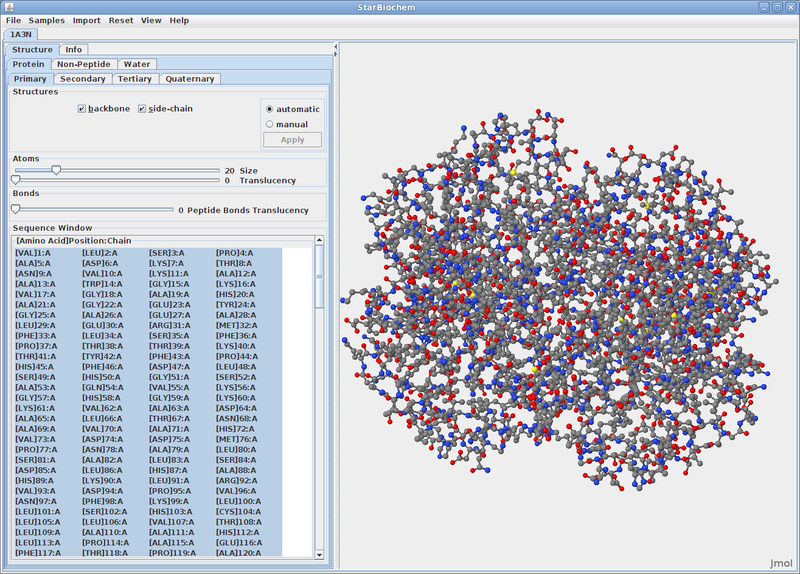 StarBiochem allows for selection of groups or individual atoms and structures. To select a single item in the Sequence Window simply click on it. To select multiple items individually, click on the first item, press Ctrl (PC/Linux) or Apple (Mac) and click on the remaining sequences desired. To select multiple amino acids as a group click on the first amino acid, press Shift and click on the last amno acid. To select multiple groups of amino acids, click on the first amino acid, press Shift and click on the last amino acid in the first group. Then press Ctrl (PC/Linux) or Apple (Mac) and click on the first amino acid of the next group, press Ctrl+Shift (PC/Linux) or Apple+Shift (Mac) and click on the last amino acid of the group. To unselect an amono acid press Ctrl and click on it. To select a single chain in the Sequence Window simply click on it. The Quaternary tab does not allow partial chain selections. To select multiple chains, press Ctrl while clicking on each chain. To unselect a chain press Ctrl and click on it. StarBiochem has several additional tools to manipulate structures. In the top menu select Reset to view the reset options. Reset camera, resets the image in the viewer to the default position after it has been rotated or moved. Reset structure, resets the selection in the Sequence Window and the image in the viewer to the default size, color and position for the selected file only. Reset all structures, resets the selection in the Sequence Window and the image in the viewer to the default size, color and position for all open files. 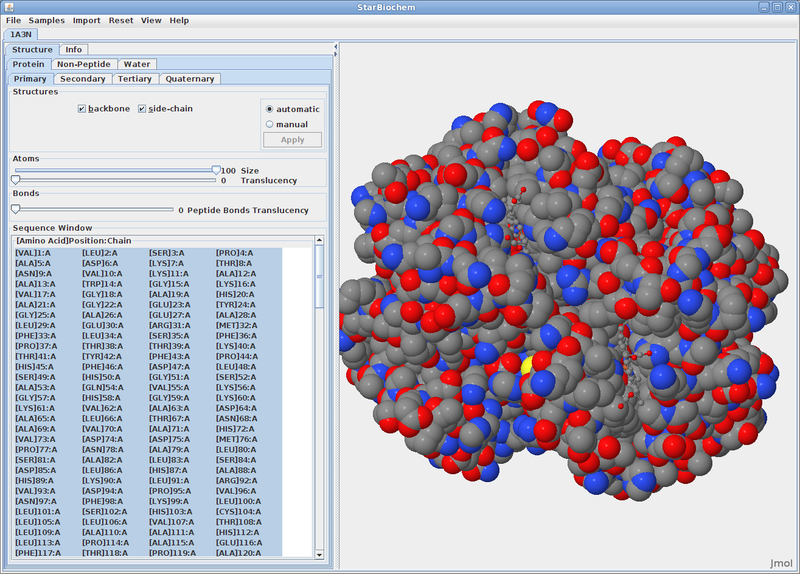 Most pdb files do not show the hydrogen atoms for the structure. To show the hydrogens for a structure go to the top menu and select View. Select the Show/Hide Hydrogens option. This will calculate the hydrogens for the structure. If the structure is large this may take a little time to load. From the top menu select View -> View Specific Regions / Set Center of Rotation. This will open a smaller window that contains the structure tabs and Sequence Window. Notice that nothing is selected in the Sequence Window. To change the center of rotation for the structure, select one or more amino acids from the Sequence Window in any of the tabs. 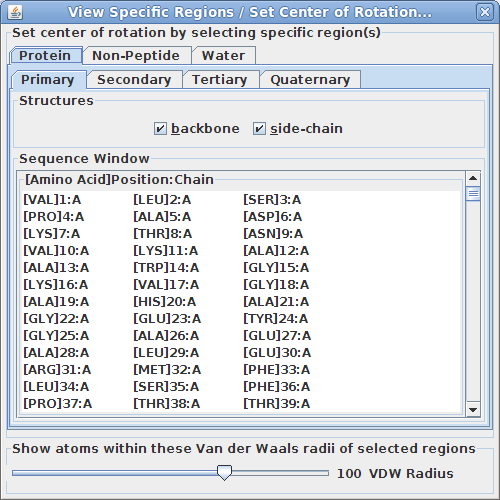 Move the VDW Radius slider to hide all atoms outside of the specified Van der Waals radii of the selected amino acid(s). This tool is particularly useful for isolating specific region(s) of the structure to examine more closely how they interact. The Info tab contains identifying details about the structure and offers resources for further research. 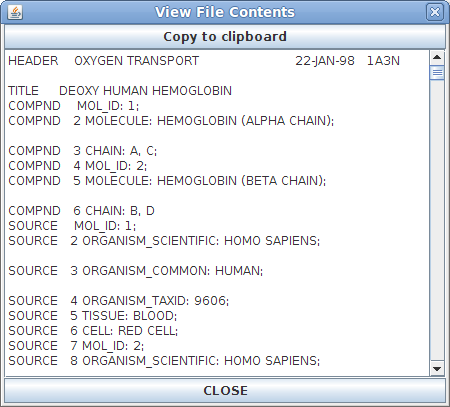 The File Contents window contains the exact contents of the PDB file that is open. This window is primarily useful for identifying a damaged PDB file or for advanced users who are familiar with how PDB files are written and work.